Lalitpur Metropolitan City – Bungamati, in Lalitpur Metropolitan City (historically known as Patan) is to get a multipurpose evacuation centre as part of a Thai-funded International Organization for Migration (IOM) programme to build eight evacuation centres in earthquake-affected districts of Nepal. Speaking at a ground-breaking ceremony yesterday (21/1), UN Resident Coordinator for Nepal Valerie Julliand said that Nepal is among the 20 most disaster-prone countries in the world. “With recent disasters – the flooding of 2017 and the earthquake of 2015 – it is crucial for us to be prepared to provide humanitarian assistance to displaced populations and to build resilience for future disasters,” she noted. “With the onset of any disaster or emergency, this earthquake-resistant centre will be used to provide shelter for displaced people, with priority given to the most vulnerable, including pregnant women, children, people with special needs and the elderly,” said IOM Nepal Chief of Mission Paul Norton. The centre will also serve as a venue for community activities, including women and youth groups, community-based training, recreational pursuits, adult literacy classes, information dissemination and income generating activities. “This project is a symbol of friendship and cooperation between Thailand and Nepal. As we now celebrate the 60th anniversary of the establishment of diplomatic relations between Thailand and Nepal, I would like to emphasize that Thailand will always stand by Nepal (to promote) closer bonds between the two countries and peoples,” said Royal Thai Embassy to Nepal Charge d’ Affaires Tanaphum Leelaporn. 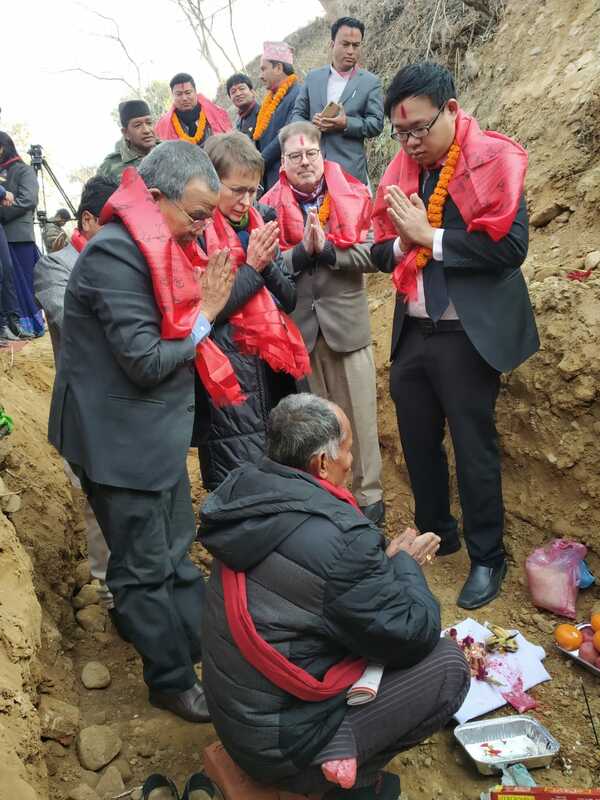 The ground-breaking ceremony was also attended by senior officials from Nepal’s Home Ministry, Ministry of Urban Development, the District Office, UN, media, civil society organizations, students, youth and women’s groups, as well as the local community. IOM plans to build similar multipurpose structures in seven other municipalities in earthquake-affected districts – Shankarapur, Kathmandu; Changunarayan, Bhaktapur; Gorkha Municipality, Gorkha; Neelkantha, Dhading; Gosainkunda Gaunpalika, Rasuwa; Chautara, Sindhupalchowk; and Bhimeswor, Dolakha. The project complements an ongoing UNDP project in the same areas. Thai, IOM and UN officials join Lalitpur Metropolitan Mayor Chiribabu Maharjan at a ground-breaking ceremony for the evacuation centre. Photo: IOM.